Susan, Mark and Michael have been friends since sharing studio space on lower Pleasant Street in Northampton in the late 70’s. All of the artists own and live with each other’s work. They incorporate joie de vivre into everything that they make and use new and vintage materials to add humor and whimsy. Susan taught art in Leverett for 24 years. Mark and Susan run a studio business from their home in Easthampton. Michael is the founder of the Anchor House for Artists in Northampton. The show will run from January 3-30th at the Hosmer Gallery at Forbes Library. Susan Boss makes non-traditional quilts in her studio in Easthampton, Massachusetts. 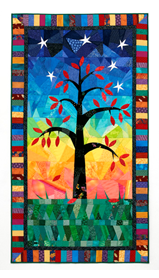 These are not ordinary quilts but vibrant fabric compositions that capture the eye and demand close inspection. Each piece is an original work. The quilts are improvisational in nature. Susan also has wall pieces. They are an exploration of the relationship between typeface, crazy quilting and proverbial language. All of the work is made with artist designed, hand cut, hand printed silk-screened letters, numerals and borders. Mark Brown will be showing 3-dimensional work made from the past 5 years (robots) as well as new paintings on canvas. These paintings are interior landscapes: imagined works that contain fantastic shapes and colors reminiscent of leaves and vines, fruits and creatures without being any of these at all. Michael Tillyer’s wooden figures are poignantly deadpan and often inspire a curious smile. They have been regularly included in Art in the Orchard and exhibited throughout the valley. Michael uses wood from his property in Conway and found materials to poke fun at popular conventions. He includes figures, animals and objects to make thoughtful, engaging compositions of great beauty.